GVAX TV Air - 100% Latino by GVAX S.A.
GVAX TV is Europe’s leading subscription service for watching Latin American Live-TV on your phone, tablet and TV. 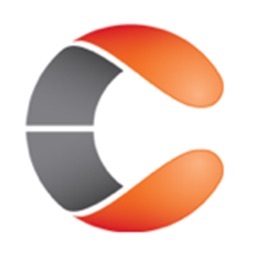 This GVAX TV Air mobile application delivers the best experience anywhere, anytime if you are from Latin American origin but residing, working or traveling to the Americas, Europe, Eastern Europe, North Africa and Middle-East. Get the free app as a part of your GVAX TV Air or Ultimate membership and you can instantly watch more than 140 free-to-air local channels from Latin America and the original local channels from your country of origin. 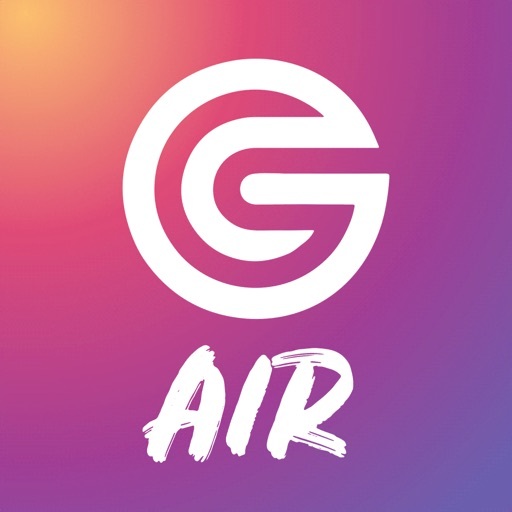 If you are not a GVAX TV member, sign up for GVAX TV Air or Ultimate and start enjoying immediately on your iPhone® or iPad® with this free App. How does GVAX TV work? 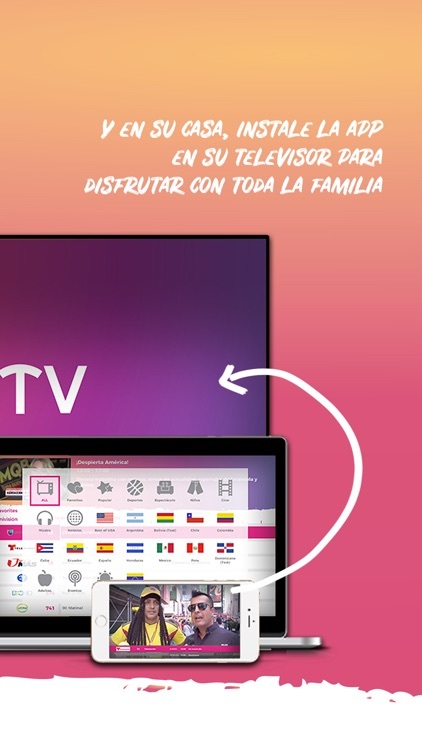 •	GVAX TV membership gives you access to the same digital TV channels you would watch in your country of Origin (Argentina, Bolivia, Chile, Colombia, Cuba, Ecuador, Spain, Mexico, Peru, US digital TV channels in Spanish) for one low monthly price. 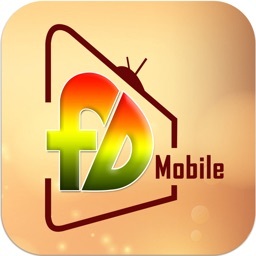 •	Clients of the GVAX TV Ultimate Box and monthly subscription plan can download this free app and enjoy GVAX TV Air subscription for free as it is included now in their GVAX Ultimate subscription. 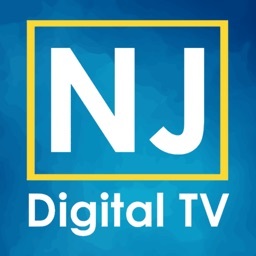 •	Watch the same channels you would watch in your home country, the same content that your family is watching while you are residing, working or traveling to the Americas, Europe, Eastern-Europe or North Africa and Middle-East. •	Enjoy your day as our famous Latin American celebrities living abroad. GVAX TV is the leading service in Europe for famous international football players and sportsmen from Latin America, their families, for the Latin American consulates and the embassies. 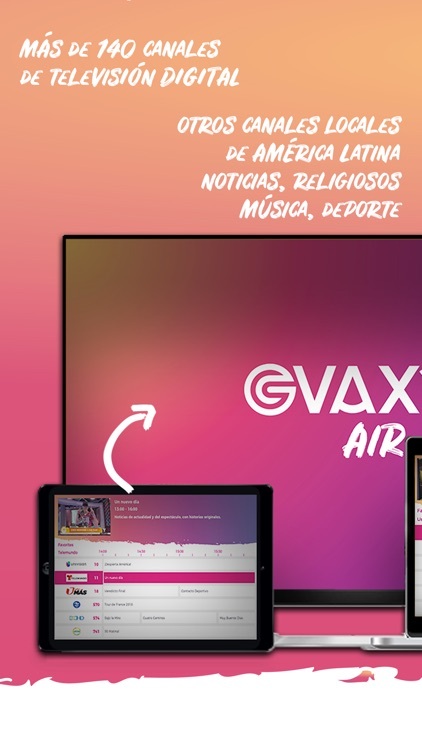 •	With the GVAX TV Air app you can instantly watch all Latin American Digital TV channels, as often as you want, anytime you want. 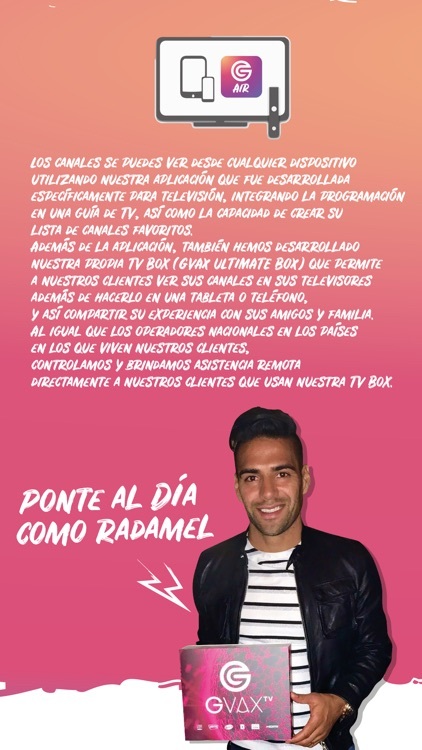 •	You can Browse a growing selection of channels that are all displayed in categories, like Argentina, Bolivia, Chile, Colombia, Cuba, Ecuador, Spain, Mexico, Peru, Popular US digital TV channels in Spanish, News, Entertainment, Kids, Cinema, Music, Sports, Religious. All channels are in Spanish language. 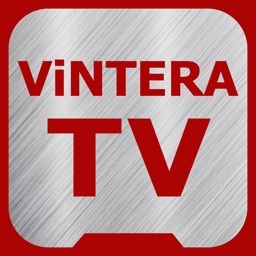 •	Your membership enables you to create your own favourite list of channels and your own TV Guide. 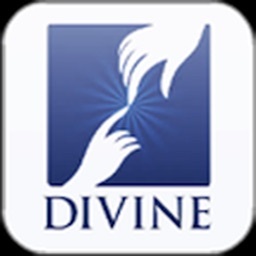 •	Instantly stream on iOS devices. Your GVAX AIR membership is a month-to-month subscription that begins at sign up. You can easily cancel anytime, online, 24 hours a day. There are no long-term contracts or cancellation fees. Just sign up to get started! If you haven’t subscribed through iTunes, you can manage your subscription through GVAX.